Water Damage Connecticut Pros, FREE Inspection! Connecticut » Blog » Water Damage Restoration » Water Damage Connecticut: Does Mother Nature Hate Us All, can Chuck Norris Save Us? Water Damage Connecticut: Does Mother Nature Hate Us All, can Chuck Norris Save Us? One week after heavy rain flooded parts of the Mid West and Northeast, communities are beginning to dry out with one question weighing heavily on their minds: does Mother Nature hate us all? According to the top water damage Connecticut companies flood cleanup calls reached a new seasonal high this last month when out-of-the-ordinary weather patterns dumped buckets down causing water levels to rise and flood streets, homes and businesses. Some argue that Mother Nature has a vendetta and is getting back at us for polluting her spirit with chem trails and carbon emissions. After all, flooding was a rare occurrence back in the “good ol’ days” when adorable back-woods hicks galloped around on horses and the wrath of transportation pollution was the stuff of fiction. Can Chuck Norris Save Us? They say that every time there is an earthquake it is because Chuck Norris is doing pushups. Instead of having the top water damage Connecticut teams come in to perform water damage restoration services can Chuck Norris change the fate of local communities every time Mother Nature decides to turn her skies gray and fill them with the wrathful precipitation that can devastate home values in two shakes of a lamb’s tail? Some magicians can walk on water, but Chuck Norris can swim through land. It seems he is our greatest defense against Mother Nature. However, one does not simply approach Chuck Norris for such requests. After all, when Chuck Norris was in a car accident the airbag never went off because it was too afraid to hit him. So for now, water damage Connecticut companies must humble themselves and wait because when Chuck Norris is ready to beat Mother Nature into submission, he will do so without being implored to do so. 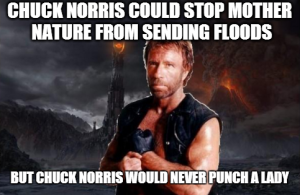 If Chuck Norris doesn’t offer to sit on your roof and threaten the sky every time it looks like rain, you would be wise to install sump pumps in the lower level of your home, in the basement and in the crawl space. Also, make sure your gutters are cleaned out and your downspouts are turned away from the home extending at least one foot out. If Mother Nature feels particularly enrages you would be wise to install storm shutters and get some sandbagging materials to protect your home if you live in an area that is especially prone to flooding. So Does Mother Nature Hate Us All? Who knows; she is a capricious lady and, perhaps, one reason why she continues to punish us with floods, tornados, hurricanes and earthquakes is because Chuck Norris is a gentleman and refuses to punch a woman. Perhaps the best thing we can do as citizens of Her planet is to try to coexist while taking steps to protect our homes from weather, and to trust in Chuck that if he is truly needed, he will come and deliver us from the fetters of weather woes.